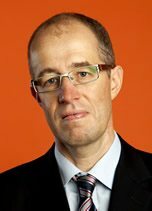 Doctor Magnus Simrén is working as Consultant in the Department of Internal Medicine, Sahlgrenska University Hospital, Göteborg, Sweden, and is Professor in Gastroenterology at the Department of Internal Medicine, Institute of Medicine, Sahlgrenska Academy at the University of Gothenburg. Doctor Simrén has a 50% research position in Molecular Gastroenterology at the Swedish Research Council 2011-2016.
committee of the European Society of Neurogastroenterology and Motility (ESNM), a councilor of the American Neurogastroenterology and Motility Society/Functional Brain Gut Research Group (ANMS/FBG), and of the Association of National European and Mediterranean Societies of Gastroenterology (ASNEMGE), as well as a member of the United European Gastroenterology Federation (UEGF) Scientific Committee. He has been working as Deputy Editor and Associate Editor of Gut, and will from 2012 be the Clinical Editor of Neurogastroenterology and Motiliy. He is also currently a member of the editorial board of Gut, Clinical and Experimental Gastroenterology and Frontiers in Enteric Neuroscience, and a member of the journal management committee of Neurogastroenterology and Motility. In 2006 Doctor Simrén received the Rising Star Award from the Association of National European and Mediterranean Societies of Gastroenterology (ASNEMGE) and in 2007 a research award from the International Foundation for Functional Gastrointestinal Disorders.